You are currently browsing the archives for the Rosacea category. Fractora is skin treatment, that delivers RF (RadioFrequency) energy to the dermal tissue of the skin through an array of tiny pins similar to micro needles. 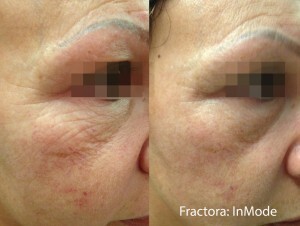 Fractora delivers improvements in the broadest range of symptoms of aging skin including sagging skin, improve definition, fine lines, deep lines, texture, even visible blood vessels in the face. It is also effective for addressing acne and reducing the appearance of acne scars. 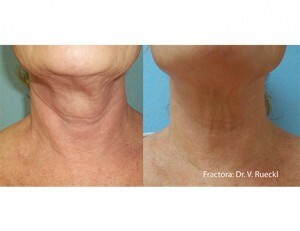 Fractora uses tiny needle like pins to precisely deliver RF energy to various selectable depths in the skin. While laser resurfacing procedures work from the top down, Fractora works from the bottom up, allowing for safe treatment to deeper layers of the dermis. Similar to fractional laser treatment, fractora treats a “fraction” of the total surface area, so the untreated skin between the pins helps to promote faster healing of the treated tissue. As with all fractional treatments, more than one treatment is recommended. Typically 3 treatments are scheduled about 3-6 weeks apart. 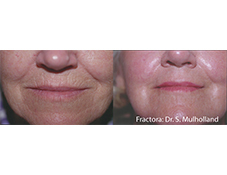 Fractora provides optimal collagen remodeling and skin tightening in the deep layers of the skin, causing lifting, tightening, smoothing skin texture and an overall improved appearance. Sometimes, a treatment that is originally designed to address one issue, can has the surprising benefit of addressing another. 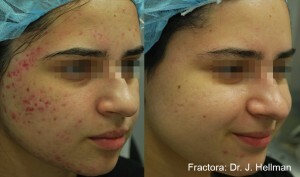 In this case Fractora, is effective at reducing acne lesions. Research suggests that this may be due to a temporary shrinking of the sebaceous (oil) gland. This is exciting news, because in the past we would want to have acne well-controlled before treating acne scars, and now there is potential to address both at the same time. Fractora has been shown to reduce visible vessels around the nose and on the face. Although, it has been shown to treat broken blood vessels I would not consider RF Needling as a rosacea specific treatment per se. However, Fractora is certainly an option to be considered for rosacea sufferes looking to also address acne that may be assosiated or signs of aging like fine lines. Fractora is commonly used on the face and neck, but body areas may be treated as well, including chest, arms, abdomen and thighs. It may be used to improve skin texture on non-facial skin or improve stretch marks or scars on the body. The RS2 Facial is designed specifically for any dry skin with micro-circulation or vascular skin conditions, not just Rosacea. It is also ideal for anyone suffering from severe sensitivity, broken capillaries even hot flashes. The RS2 Rosacea Facial features an alleviating Pevonia French Rose thermal clay mask, which provides soothing relief and visible results to dilated capillaries, congestion, blotchiness, and irritability. Comforting and healing ingredients such as: Rose, Green Tea, Chamomile and Liquorice, combine to properly decongest and calm your skin for an even, healthy appearance. These powerful natural ingredients known to help rosacea, Green Tea which is healing and anti-bacterial, Chamomile which has a calming and distressing effect on the skin and French Rose essential oil, which calms redness and reduces stress with its light, natural fragrance. This treatment can be customized to include dermaplaning for gentle exfoliation, extractions and blue light therapy to kill bacteria for those who suffer with acne rosacea. April has been designated as “Rosacea Awareness Month” by the National Rosacea Society (NRS). Rosacea is a progressive skin disorder commonly characterized by flushing and persistent redness on the central portion of the face and visible blood vessels. It has been estimated more than 16 million Americans are affected by Rosacea. The effects of Rosacea can go beyond this visible symptoms, often causing discomforts such as stinging and burning. For the majority of rosacea suffers it effects self esteem, going as far as to effect professional interactions. Rosacea is a progressive skin disorder with symptoms including flushing, redness, visible blood vessels, burning, and stinging. Rosacea can also cause acne like symptoms, such as little bumps called papuals, often refereed to as Acne Rosacea. In more severe cases, there is a thickening of the skin and the nose can present as bulbous with irregular nodularities and enlargement, known as Rhinophyma. There is also a subtype of Roscacea, known as Ocular Rosacea, where eyes are red or bloodshot with burning and stinging. Rosacea is a progressive disorder and, left untreated, will worsen in severity with time. Those with Rosacea often experience flare-ups, which can last for months. Only a doctor can diagnose Rosacea. If you suspect you have Rosacea, see a dermatologist. The exact cause of Rosacea is not completely understood. Suggested possibilities include auto-immune disease or defects in the nervous system which effects blood vessels or Demodex mites. It may be something there is a genetic predisposition to. What we do know is that there is a strong vascular component to Rosacea. We also know that there are “triggers” such as heat or spicy foods that can trigger flare-ups. It is important to understand that there is not a cure for Rosacea, but it is something that can be treated to reduce severity and symptoms. First, those with Rosacea should work to understand what their specific triggers are. Avoiding triggers can reduce the frequency and severity of flare-ups. Finding skin care products that do not aggravate rosacea can be tricky. Consult with a Dermatologist and Esthetician for skin care recommendations appropriate for Rosacea skin. Intense Pulse Light (IPL) remains the most effective treatment for addressing the redness and visible dilated blood vessels seen with Rosacea. Vascular lasers, such as a KTP or Yag, can be used to treat facial veins that are well visible and can be traced. Typically, 3-6 treatments are needed, scheduled about 3 weeks apart. Because there is no cure for Rosacea, a series of treatments may need to be repeated annually, depending on severity. Botox injections have been shown to be effective when injected superficially in very dilute concentration to reduce the redness and flushing of Rosacea. Redness may be reduced for 3-6 months after injections. This treatment is currently considered “off-label”. Facials will not correct any vascular component of Rosacea, but the appropriate facial can calm and sooth skin. Consult with your Esthetician Facialist for recommendations. I can not tell you how many times I have been in the mall or a beauty store and heard a sales person give a shopper horrible advice on skin care. To the defense of the sales person, they probably are unaware they are giving poor advice, they are likely not trained skin professionals. Often the product they recommend cost just as much, if not more than the more effective cosmeceutical products used by skin professionals. An in-depth consultation with an licensed Esthetician should be your first step to addressing aesthetic skin concerns such as aging. Even if you are just looking for professional advise on appropriate skin care to maintain your skin, a skin consultation is needed. Standing in the front office and talking to the office staff or even an Esthetician between appointments, does not cut it. Not everyone is qualified to give skin care advice, even the Esthetician can not give you the attention you need in 5 minutes. A full consultation is always the best way to go. We have put together a list of tips to help you get the most out of your skin consultation. An Esthetician is a skin care specialist, that has been educated and trained on skin health and beauty. They do not diagnose or treat medical skin conditions such as eczema, psoriasis, allergies or skin cancers. An Esthetician may work in a day spa, salon, med-spa or within a medical practice such as dermatology or plastic surgery. When selecting an Esthetician, be sure to ask about experience and training. Some Estheticians may have additional training or certifications to work in medical aesthetics. You should look for an Esthetician that fits your personal goals. If you can help your Esthetician understand what you see, and what concerns you most, then they can better help you. We recommend you make a list of concerns and what you hope to improve. It may help to look in a mirror while creating your list. If you simply want to maintain your skin, we can help with that too. The more clear you are about your concerns, the more likely they will be addressed. You may have skin issues or signs of aging that do not bother you, your Esthetician does not want to offend you by suggesting that you improve something that you are content with. Estheticians understands that most people have a budget and we want to respect your money, so be sure to communicate the priority of your concerns. Pigmentation Concerns Is your skin color even or do you notice irregular pigmentation such as Melasma, dark patches, freckles, age-spots, sun spots or pigmented scars. Acne / clogged pores Do you have any cysts, pimples, black heads, white heads or clogged pores. Do breakouts correlate with menstral cyle or hair removal. How often do you break out. Texture Is your skin smooth and even or does it feel rough or flakey. Does your skin look creapy, have fine lines or scars that are raised or depressed. Vascular Issues Do you have Rosacea, broken capillaries, diffused redness or red spots. Do you flush easily? Oil and Moisture Is your skin normal, oily, shiny, dry, tight and dry? Aging concerns Do you have any lines, wrinkles, folds? Is your skin that lax or thinning. Is your facial volume plump and cohesive or do you see separation of the fat pads, hollowness of the face or under eyes, flat cheeks, or jowls? Do you have droopy or hooded brows? Hair Even if you are only seeking skin treatments, let your Esthetician know if you experience unwanted hair, specifically facial hair and how you address it. Hair growth and hair removal methods may provide clues to skin issues. ( This applies to men and women) Some hair removal methods my be contraindicated to potential treatments or products. Estheticians specialize in hair removal methods, so they can provide you with or suggest the most appropriate hair removal methods. Be prepared to talk to your Esthetician about the skin care products you have used in the past and are currently using. When filling out your consultation form, it is not enough to list a brand name or only including a couple products. We need a detailed list of the products you are using and it is even better if you bring the products in with you, so that we can read the ingredient list. Not all skin care products or ingredients play well together, for example products with Benzoyl Peroxide can oxidize your topical antioxidants. Acne and anti-aging products usually active ingredients and if we mix too many, the skin may become very irritated. You may already be using something similar to what we would recommend and we do not want you to purchase something, if you already have it or something like it. Your Esthetician will try to work with your current products, when possible. Sometimes, however it may be necessary to start from scratch. Think back to any cosmetic procedures or skin care treatments you may have had and make a list. Your Esthetician will need to know what procedures / treatments you have done. Some things should not be repeated too soon, while others my be contraindicated to each other. For example if you have had deep (full coverage) resurfacing procedures, your Esthetician will want to know because they can not be repeated too frequently. If you have recently had certain injectables, you may need to wait before having some procedures. If you have ever had any silicone injections or have you been on accutane, you need to alert your Esthetician. Tell your Esthetician what you liked or did not like about the things that you have already done. If you had a good experience with something, that will provides a clue to how you respond to treatment. If you feel something did not work or you had a bad experience, we do not want to repeat that for you. Sometimes, your Esthetician may want to spend some time educating you on why you had that experience. Never assume anything is irrelevant. Your Esthetician will want to know a little about your medical background and medications. Some medications may increase chance of bruising or cause photosensitivity. Do not forget to list any supplements or herbal treatments you may use. Remember to list any allergies, including food allergies, as some skin care products contain natural ingredients like pumpkin, papaya and pineapple. Medical conditions can effect how your bodies wound healing ability and how your skin responds to treatment. When listing medical conditions be sure to include any hormone therapy. Your lifestyle and habits are important too. How do you exercise, are you on a restrictive diet, do you smoke, drink or use any other substance. We are not here to judge you, we need to take into consideration the variables that may influence how you will respond to treatment. If you have any special scheduling concerns, be sure to discuss them during your consultation. As you are discussing treatment options, be sure to clarify what you should expect. Often clients do not understand that they should expect some reaction with treatment or even some skin care products. Be sure you have an idea of what is normal and when you should be concerned. If you are having a treatment that involves any “down time”, your Esthetician will give you an idea of how long it will take to recover. Keep in mind, that this is just an estimated time frame. There are far too many variables that effect healing, it is impossible to predict exactly. It is also relative to what you consider to be “down time” and when it comes to your appearance being acceptable to return to work or social activities, everyone has different standards. Before scheduling treatments, be sure you understand what typical results are. Often clients hear what they want to believe, expecting too much. Its tempting to hope that even if your Esthetician recommends a series of treatments, that you will be the exception. Sometimes we convince ourself that a non-surgical treatment will deliver a surgical result. We want to believe that one treatment can replace the need for others or that what we do at home isn’t that important. Try to keep your expectations realistic. Be sure to find out about your consultation fee, often the consultation fee may be credited toward your first treatment. As a courtesy, many Estheticians offer a free consultation. This likely means they are not getting paid, so if you can not make your appointment, call to cancel or reschedule as soon as possible. A minimum of 48 hours prior to scheduled appointment is standard, this allows time to fill the space. Imagine a skin treatment that has the ability to treat sun damage, rough skin, freckles, skin discolorations, redness, broken blood vessels, rosacea, acne, kill acne causing bacteria, reduce oil glands, minimize pore size, improve appearance of some acne scars and treat precancerous Actinic Keratose. Believe it or not, such a treatment does exist! The skin treatment I am referring to is PhotoDynamic Therapy (PDT). PhotoDynamic therapy is a non-invasive, non-ablative treatment with little to no down time. PhotoDynamic Therapy (PDT) is a 2 part skin treatment that uses the light activated drug therapy, Levulan (aminolevulinic acid) also known as ALA. Levulan is a topical agent that is used to photosensitize the skin prior to light based treatments such as IPL (photofacial) and blue light acne treatments. Adding Levulan (ALA) to a photofacial IPL treatment, is a bit like putting your photofacial on steroids. The Levulan photosensitizes the skin, allowing the IPL energy to be better absorbed by the targeted pigmented and vascular chromophores. This results in a higher level of correction of freckles, sunspots, skin discolorations, broken blood vessels and redness compared to photofacial alone. Although, Levulan in it’s self does not penetrate to dermal layers of the skin, the heat and inflammatory response caused by PhotoDynamic Therapy does reach the Papillary dermis. This heat stimulates the fibroblast to produce collagen. PhotoDynamic Therapy is unique because Levulan is absorbed by abnormal cells, such as those of Actinic keratosis (AK’s). Aminolevulinic acid is also absorbed into the oil glands and hair follicles. When the Levulan is activated by the appropriate light or laser it damages the oil glands and reduces P. acne bacteria. Acne can be affectively treated by using Levulan to pretreat the skin before IPL (photofacial) or Blue light treatments. First your skin is pretreated with an acetone scrub, to remove oil from the skin’s surface. Sometimes microdermabrasion is also preformed before the Levulan is applied. Microdermabrasion will remove dead skin cells and cause blood vessels to dilate, which will result in a more effective treatment with IPL. After the skin is prepped the Levulan Kerastick is cracked open and applied to the skin. Aminolevulinic acid (ALA) doesn’t sting or burn like acids used in chemical peels. The ALA is left on the skin to “incubate”. The incubation time can be anywhere from 1-8 hours, a longer incubation time can cause more reaction as well as more correction. Non-facial skin generally requires a longer incubation time. Once the Levulan is applied, you must avoid sun exposure for 40 hours. Topical anesthetic may also be used. After the Levulan has been on for the determined amount of time, the skin is then treated with IPL and/or Blue Light. 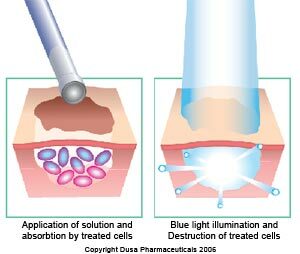 The light will activate the ALA. Blue Light is used specifically to treat acne and can be done alone or with IPL. The degree of post treatment reaction will depend on the amount of skin damage and how aggressive the treatment is done. The Luvulan can be left to “incubate” longer, before it is activated for a more aggressive treatment. Those with a lot of sun damage or active acne can expect to have more reaction. Some people will experience little to no side effects. Similar to photofacial, pigmented spots will become temporarily darker, until they flake and peel off. The treated area will likely appear pink or red for the first few days and peeling may also occur and last for up to 7 days. Some may also experience mild swelling that lasts a couple days. It is important to avoid sun exposure for the first 40 hours post treatment, sun block will not protect skin against photosensitivity reactions caused by visible light. Sun exposure can cause stinging, burning, redness and swelling to the treated area. The amount of treatments needed will depend on the skin condition and level of correction desired. There is significant improvement with each treatment. Some people may be satisfied with a single a treatment, however for optimal results a series of treatments are recommended. Treatments can be scheduled as soon as 3- 4 weeks apart. Schedule a consultation to determine if you are a candidate for PhotoDynamic Therapy, and set up a treatment plan. Rosacea is primarily a facial vascular disorder in which blood vessels are functionally and structurally abnormal. Currently rosacea can’t be cured, however it can be effectively treated and controlled. Rosacea is a progressive skin disorder, that should be treated when symptoms first begin. Treatment should be aimed at treating the underlying vascular issues associated with rosacea. Vascular Lasers and IPL treatments are extremely effective at treating existing redness and broken blood vessels. In addition to avoiding rosacea triggers, topical products can be used to prevent flushing and further damage that can accelerate the progression of the disorder. Both Laser and IPL therapy are very effective at treating telangiectasia (broken blood vessels), generalized redness and flushing. IPL therapy can also be enhanced with Levulan to get the added benefit of treating acne, rosacea papules and pustuals. Lasers that are absorbed well by hemoglobin are used to treat vascular concerns. The laser energy is absorbed by the blood vessel and creates heat within the vessel which damages the vessel wall and permenatly closes that vessel. The treated vessels are then absorbed by the body. Although there isn’t a cure for rosacea, studies show that laser treatment can permantly remove damaged facial blood vessels and with repeated treatment blood vessels will not always be created to replace the old vessel. Facial blood vessels treated with lasers are sometimes replaced with connective tissue. This is good news, because this will permently reduce the number of blood vessels in the face, near to the level of vessels found in healthy skin. Lasers have a single wavelength that work at a very specific depth. So any idividual laser has it’s limitations. KTP 532 nm and Pulsed Dye: 577 -585nm lasers are well absorbed by hemoglobin and are very effective at treating superfical blood vessels in the face, while Nd:YAG 1064nm lasers are also well absorbed by hemoglobin, they are effective at treating vessels that are located deeper in the skin. IPL skin treatments are known by many names including Fotofacial, Photofacial, Photoderm and Photo rejuvenation. Intense Pulsed Light (IPL) differs from lasers because IPL uses a wide spectrum of wavelengths at the same time (for example: 500nm — 1200nm) that can target any chromophore in that range, while lasers have a single wavelength. You can think of the laser like a sniper that can precisely hit a single target with one shot, and IPL is like a grenade that hits several targets at once. IPL uses special cut-off filters that can be selected to target chromophors in a certain range within the skin. When treating rosacea or any vascular concern, the intended target is hemoglobin. The advantage IPL treatments have over laser treatments is that IPL can target vessels at different depths. Best results are achieved when you combine IPL and Laser treatments. IPL and Laser treatments can be done independently, however combining technologies at the same treatment time will provide a better result. This type of treatment is fairly aggressive and should only be done by someone that is very experienced in combining these technologies. Metronidazole is topical agent used to treat rosacea, available only by prescription. The primary action of Metronidazole is anti-inflamatory. Metronidazole is effective at reducing papules and pustules and has a fairly minimal effect at reducing inflammation. Unfortunately, it isn’t effective for treating broken blood vessels or flushing. Antibiotics have long been used to treat rosacea, however they work primarily through their anti-inflammatory properties rather than antibacterial. Antibiotics are effective at reducing papules, pustules, and inflammation. The limitation with antibiotics is that they are not effective at treating telangiectasia or flushing. Antihistamines are effective at reducing facial inflammation, swelling and burning associated with rosacea. Histamine contributes to swelling, itching and burning. Histamine has also been shown to play a role in inflammation and redness. UV rays can penetrate the skin and activate sensory nerves that release potent vasodilators, as well as creating heat in the skin causing facial flushing. Zinc oxide reflects both UVA and UVB rays, blocking out heat from the sun. Topical zinc oxide also has significant healing properties when applied to damaged skin and has been shown to decrease inflammation in both the epidermis and dermis. 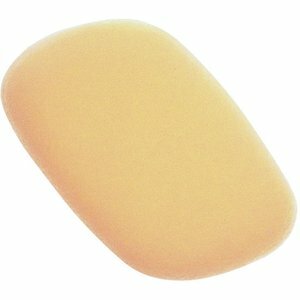 Dimethicone is a silicone based ingredient with moisturizing ability. Dimethicone is also a protective ingredient that has been shown to reduce flushing caused by skin irritants. Free radicals have been shown to cause structural damage to vascular walls and many free radicals are potent blood vessel dilators. Dietary and topical antioxidants help to block the damaging effects of free radicals. Studies show that vitamin C can protect blood vessel walls from free radical damage and reverse existing vascular damage. People with rosacea should get plenty of vitamin-C in their diet, and may want to consider a vitamin-C supplement. In addition to being a great antioxidant, topical vitamin-C has anti-inflammatory qualities. *This post is intended for informational purposes only. Rosacea is a vascular disorder that affects facial skin and eyes, causing facial redness, inflammation, broken blood vessels and red bumps known as inflammatory papules. Rosacea is a progressive disorder beginning with mild symptoms, and if left untreated can become severe. Rosacea treatment should begin as soon as possible to slow the progression, with an emphasis on treating the underlying vascular disorder. With continued treatment and avoidance of rosacea triggers, suffers can control their symptoms and slow or prevent further progression. This post is intended for informational purposes only. Only a Doctor can diagnose rosacea, if you suspect you have rosacea you should consult with a physician, as facial flushing can be a sign of other systemic disorders. If you do have rosacea it is a good idea to begin a rosacea diary to track your specific triggers. Begin treatment as soon as possible to control your rosacea and do your best to avoid triggers. Pre-rosacea is characterized by frequent, temporary bouts of flushing and blushing. Facial redness disappears immediately after the trigger is over. Mild rosacea is characterized by flushing and redness that lasts for an abnormally long time after trigger is over (half hour or more). Broken blood vessels (telangiectasia) may be present and skin may be sensitive to products. 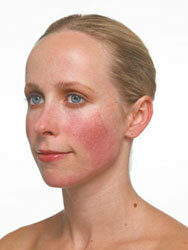 Moderate rosacea is characterized by facial redness that last days or even weeks. The nose and cheeks may have a semi-permanent redness, causing a sunburned appearance. Swelling, burning, broken blood vessels, and inflammatory papules may be present. Some people may experience eye symptoms such as irritation, dryness, crusting, sensitivity to light, swelling of the eyelids, and a feeling of a foreign body in the eye. Severe rosacea is characterized by severe flushing, inflammation, burning and swelling. Inflammatory papuals, pustules and nodules may develop. Rosacea that progresses to this point can be painful. In some cases rhinophyma may develop, this is a bulbous enlargement of the nose. Blood vessels deliver oxygen and nutrients to the skin, as well as remove waste generated from skin cells. It is important to understand that blood vessels help regulate internal body temperature. When the body internal tempeture is high, blood flow will increase through the vessel to release heat from at the skins surface. Vessels are made up of several layers, each of which serves a specific purpose. When discussing rosacea, we are most concerned with the middle layer which is composed of vascular smooth muscle cells, and the inner layer which is composed of endothelial cells. The smooth cells, or the muscular layer of blood vessels serve to control blood flow through dilation and constriction. When the muscular layer contracts the blood vessel will become more narrow and decrease blood flow through the facial skin. The constriction of these vessels will cause the skin to be less red. When the muscle relaxes, the blood vessel dilates or becomes wider which will increase blood flow through the skin. The dilation of facial blood vessels will cause the skin to be more red. The endothelial cells line the inside wall of blood vessels and release potent dilator substances. When these dilators are released they diffuse to the smooth muscles cells and cause the vascular muscle to relax or dilate. When the vessel dilates, blood flow to the skin increases causing flushing and redness. Rosacea is primarily a facial vascular disorder in which blood vessels are functionally and structurally abnormal. With rosacea there are functional changes that take place in vessels. The blood vessels in facial skin become hyper-responsive to internal and external stimuli. Vessels may dilate to a substance that normal blood vessels would not respond to. They may also dilate or open more widely than normal blood vessels, and stay open for an abnormally long time. The structural changes of facial blood vessels, lead to the progression of rosacea. – The muscular layer of the vessels may be thin and damaged. Heat will cause blood vessels to dilate, allowing more blood to flow to the surface of the skin and causing facial flushing. Heat from both external and internal factors will cause facial flushing. In rosacea skin this reaction is exaggerated. Although cold temperatures initially cause blood vessels to constrict, over an extended time the skin cells can become deprived from oxygen and nutrients, which can trigger the release of potent dilators. Flushing caused by cold temperatures are influenced by the how cold and for how long skin is exposed to the cold factor. For example cool air will cause less constriction than cold air and would not deprive skin of oxygen and nutrients in the same way cold air does. Cool air will not cause flushing, but cold air may. Facial nerves play a major role in rosacea flushing. Many medical experts believe that rosacea is a neuro-vascular disorder, meaning that the facial nerves release dilators onto blood vessels which intern causes flushing. Sympathetic nerves help regulate thermoregulatory flushing, this type of flushing helps reduce internal body temperature and serves to protect the brain from heat. If the internal body temperature is to high, the brain activates sympathetic nerves, which release neurotransmitter substances on to blood vessels, telling them to dilate and causing flushing. Consumeing hot beverages and food, as well as exercise can activate sympathetic nerves. Even emotional stress, anger and embarrassment can trigger these nerves. Parasympathetic nerves are partially responsible for flushing caused by certain foods, crying, facial movement, and even facial pain. It is important to note that even mild foods can cause flushing, and each person may find they respond to different triggers. Sensory nerves release potent vascular dilators and are responsible for flushing caused by skin irritations, and environmental factors such as wind, heat and sun. can penetrate the skin and activate sensory nerves, as well as creating heat in the skin causing facial flushing. Clinical studies suggest that blood vessels are often the first structure encountered by free radicals and can be the hardest hit. Causing structural damage including weakening the vascular walls. In addition to the vascular damage, many free radicals are potent blood vessel dilators. Intense Pulsed Light (IPL) is used in photo-rejuvenation for the skin and hair removal treatments. Broad Band Light (BBL) is essentially the same thing as IPL and is used in the same way. Intense Pulsed Light (IPL) is not actually a laser. IPL emits a non coherent, broad spectrum light, rather than a monochromatic single wavelength like a laser. Basically lasers have one wavelength ( for example: 800nm) with a very specific target, and IPL uses a wide spectrum of wavelengths at the same time (for example: 500nm — 1200nm) that can target any chromophore in that range. You can think of the laser like a sniper that can precisely hit a single target with one shot, and IPL is like a grenade that hits several targets at once. IPL uses special filters that block unwanted wavelengths. The filters can be changed to “cut off” the shorter wavelengths. The appropriate filter will depend on the depth of the intended target. The cut off for the wavelength at the deeper end is predetermined, but can vary with each devise. and has 7 filters: 515, 560, 590,615, 640,695, and 755. The 515 filter would block out wavelengths above and below 515nm – 1200nm, while the 560 filter would block out wavelengths above and below 560 -1200nm. The deeper wavelength, in this case 1200nm remains the same, while the “cut-off” filter can be changed to block out specific shorter wavelengths. Each devises may use different wavelengths. IPL is well absorbed by chromophores that have color such as melanin, hemoglobin. The concentration of a specific chromophore peaks at different depths in the skin. The filter used in treatment is decided based on the depth of a desired target and the color of skin. A deeper cut off filter would be used for hair removal, while a shallow filter would be used when treating vascular issues such as rosacea. It is important to remember that IPL targets color in the skin, so tanning must be avoided before treatment. Patients with darker skin should seek treatment from someone experienced in treating their skin type, to avoid complications. IPL treatments can provide beautiful results, but can also cause serious burns. It is the patients responsibility to choose an experienced professional, be honest about sun exposure and follow all pre and post treatment instructions. 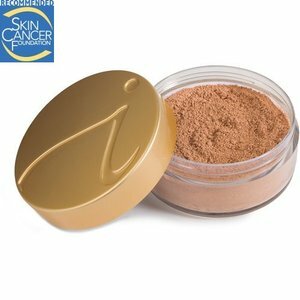 Jane Iredale mineral makeup is recommended by plastic surgeons, dermatologists and estheticians. – Can be used after cosmetic procedures such as chemical peels and laser treatments. other sunscreens may cause irritation or are not recommended. – Water resistant, won’t crease or smear even during the most strenuous exercise. – Anti-inflammatory and Anti-microbial, making it ideal for acne, rosacea, and post procedure skin. – No Talc, most powder is 50% – 80% talc. Talc is a cheep filler that will exaggerate peeling or further dry skin after cosmetic procedures. 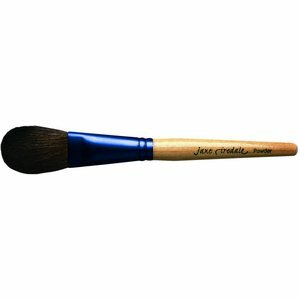 Jane Iredale brand of minerals is highly pigmented and are micro-pulverized. Other mineral make-up brands are milled on average of 3x, compared to Jane Iredale minerals that are micro-pulverized 11x and then sifted thru a silk screen. This allows for more coverage while using less product, as well as eliminating the need to buff or “work in” minerals. Jane Iredale also has a huge selection of color choices, including global shades for ethnic skin. The growing popularity of mineral makeup, encouraged a second generation of mineral based cosmetics, however, drugstore and discount mineral makeup products usually aren’t “pure” minerals. Simply adding minerals to a cosmetic does not create the same benefit of a true mineral makeup. The top two ingredients should be Zinc Oxide and Titanium Dioxide, as they are the basis for a great mineral makeup. Mineral “based” cosmetics may also contain ingredients such as talc or preservatives, that are contraindicated to some cosmetic procedures. 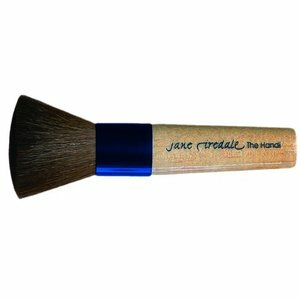 A hand-tied goat hair brush for Jane Iredale PurePressed Base. Applies Amazing Base ( loose powder) like no other brush. A sponge with a nap that glides across the skin. Applies and blends minerals. When using minerals wet, use flocked sponge and D20 spray. This facial spritz resists evaporation and helps to hydrate and plump the cells. Also containing ingredients that calm the skin and fight free radicals, D2O is a must for post-laser or after any kind of peel! Some makeup artists believe that D2O is the quintessential last step in applying our makeup. It sets the minerals in seconds. Exclusive Mineral Makeup for the Screen Actors Guild Awards Presenters Only. Exclusive Makeup for “As The World Turns” cast. Mineral makeup always looks better when you use the proper tools and technique. 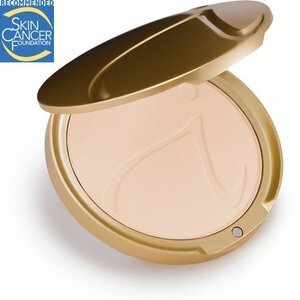 Paradise Valley Skin Klinic carries Jane Iredale Products. Call and schedule an appointment, to be color matched for Jane Iredale mineral foundation. You can follow Paradise Valley Skin Klinic on facebook.